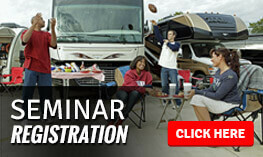 Free First Time RV Buyers Seminar Saturday, January 14! Your first RV purchase is an exciting event. New doors are opening to fun new places and exciting outdoor travel adventures. However, an educated customer is a happy buyer. It is important to become familiar with different RVs, features, mechanical components and safety, so you can make an informed decision about your purchase. 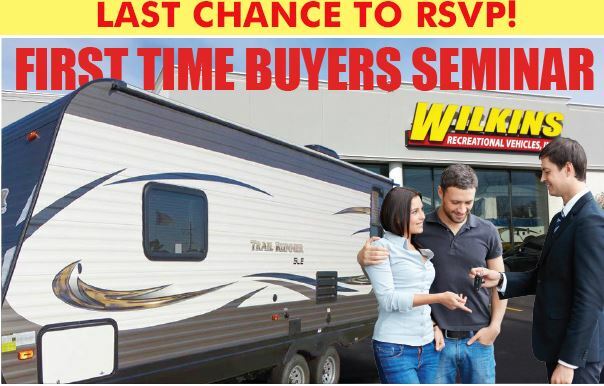 That is why, here at Wilkin’s RV, we are offering a First Time RV Buyer Seminar you won’t want to miss. With one session at each of our locations in Bath and Churchville, you can choose the seminar nearest you. If you’re thinking of buying your first RV but not sure of your ability to operate it, or if you already have an RV and have questions, this free First Time Buyers Seminar is just for you!In these informative sessions on Saturday, January 14th from 10AM- 11:30AM, our qualified RVIA service personnel will educate you on the secrets of RVing the fun way. We will share many strategies, techniques and tips all designed to ease routine operational tasks so that you can focus on enjoying your new adventures in the RV lifestyle. Topics include different types of RVs, different uses of RVs, towing an RV, core RV components, financing options, maintenance, after sale service needs and an open forum Q&A. We will show you how simple it can be and best of all, it’s free! For more information, call toll free at 800-724-2105 ask for Tammy or Kim. Sign up today and take the first step towards the exciting world of RV travel! REGISTER FOR THE FIRST TIME BUYERS SEMINAR HERE! Whether you are interested in a New or Used Class A, Class B or Class C Motorhome, Fifth Wheel, Travel Trailer, Toy Hauler, Destination Trailer or Fold Down Camper, this seminar will help you get acquainted with your new purchase. Contact Us at Wilkin’s RV for additional information on this or other future seminars that we will be hosting. We hope to see you on Saturday, January 14th at 10 AM!